As it’s been confined to the world by the CNN, Donald Trump is planning to announce withdrawal of up to 7,000 American servicemen from Afghanistan this month. As of now, there’s more that 14 thousand men stationed by Washington in this war-ravaged country, so bringing a half of them back is no small task for the Pentagon that is about to take at least a couple of months. Unsurprisingly, analysts would immediately start arguing about that we’re facing a prospect of security vacuum emerging across the Central Asia due to the withdrawal of US troops. However, what is much more curious is the answer to question is there a force that would be able to bring Kabul back to life, as the pro-Western government of Afghanistan has been on life support since the moment it was established. As the so-called Israeli political experts are now busy spreading hysteria across the regional media, predicting a regional collapse that would allegedly be triggered by the Islamic Revolutionary Guards Corps conducting war games under codename Great Prophet, it’s hard to believe that a couple of Iranian missiles fired in the immediate vicinity of the US carrier battle group stationed in the Persian Gulf can somehow destroy the Middle East. However, Israel argues that as soon as the United States finally leaves the Middle East, such countries as China and Russia and Iran will start pursuing regional hegemony. In turn, Berlin seems to be concerned that the plan to withdraw American troops from Syria and Afghanistan may affect the operations that Bundeswehr carries on conducting in these countries. As reported by the German TV channel known as N-TV, German servicemen are working hand in hand with the US military, and should the latter leave the Bundestag will have a hard time getting approval to increase the number of men it was going to deploy in those states under the pretext of combating Islamists. Against this backdrop, an official statement issued by the spokeswoman of the Chinese foreign ministry that reconfirmed Beijing’s adherence to the preservation of peace and stability across Afghanistan, while opposing use of force in residential areas across the country, felt like a breath of fresh air. At the same time, Chinese authorities would hint the international community that they are prepared to diffuse the situation in Afghanistan in cooperation with the neighboring countries of this state, namely Russia, Pakistan, India and Iran. Upon realizing that there’s no military victory for them to secure in Afghanistan, American policy makers are now busy ensuring that the imminent American withdrawal from this Central Asian state will at least look decent. It is for this reason that Washington was forced to begin another round of peace negotiations with the Taliban. However, this time around the US didn’t make any claims that it was spearheading the peace process. This latest attempt to bring peace to this war-ravaged country is led by the new US special representative for Afghan reconciliation, Zalmay Khalilzad. This American diplomat of Afghan origin would serve as the US ambassador to Kabul in 2003-2005, so he must be well-versed in ground realities of Afghanistan. However, the initiative bypasses the official Afghan government completely, which makes this whole situation rather peculiar. However,as the warming relations between China and India keep improving, it’s safe to say that those two Asian giants have a much better chance of bringing Afghanistan back on its feet. Thus, Afghanistan has every chance of becoming some sort of a safety valve, a place where India and China can cooperate and let some steam off in spite of all the tensions in their bilateral ties. Their efforts, like the projects aimed at training professional Afghan diplomats, will both serve their common interests just as it will serve Kabul’s well-being. As Washington carries on initiating unilateral trade wars, Afghanistan would come in handy as a starting point in the search for coordination and cooperation that is clearly possible between China and India. China and Pakistan have also announced their plans to re-approach both Afghanistan and the South Asia in the final press press-release of the conference held by the Pakistan-China Institute of Islamabad in mid-November. Pakistan has always been in control of the pace of military operations in Afghanistan, as well as the supply lines that across this country as Afghanistan is deprived of sea access. It’s obvious that the China-Pakistan Economic Corridor – the flagship of China’s One Belt – One Road (OBOR) global initiative that should make Beijing a dominant force on the international stage, remain highly vulnerable to prospects of regional instability, while the US-controlled Afghanistan remains mired in political and economic instability. It’s clear that Pakistan played its part in fomenting this instability, as evidenced by the words of Pakistan’s President Muhammad Zia-ul-Haq who announced some four decades ago that in oder to maintain one’s control over a foreign country, it is necessary to keep it heated up to its boiling point. As for China’s prospects of bring peace back to Afghanistan, it is enough to recall that recently China has demonstrated an unprecedented resilience in applying soft power on the factions within this country. As Beijing is set on establishing a China-Pakistan-Afghanistan coalition, its plan to construct a railway running across Afghanistan was but a first step of much larger agenda. Additionally, China has sent a number of its economic advisers to Afghanistan, trying to approach local leaders directly in a bid to affect local reforms. But, apparently, this process hasn’t been managed properly, as Afghanistan remains reluctant to launch any economic reforms, instead it will argue that it needs more investments. However, in order to back its soft power efforts, Beijing is willing to bring the military element into equation. A while ago one could come across reports stating that there the construction of China’s second foreign military base in the territory of Afghanistan was well underway. China’s media would also state that China is establishing training centers in the province of Badakhshan in northeastern Afghanistan. 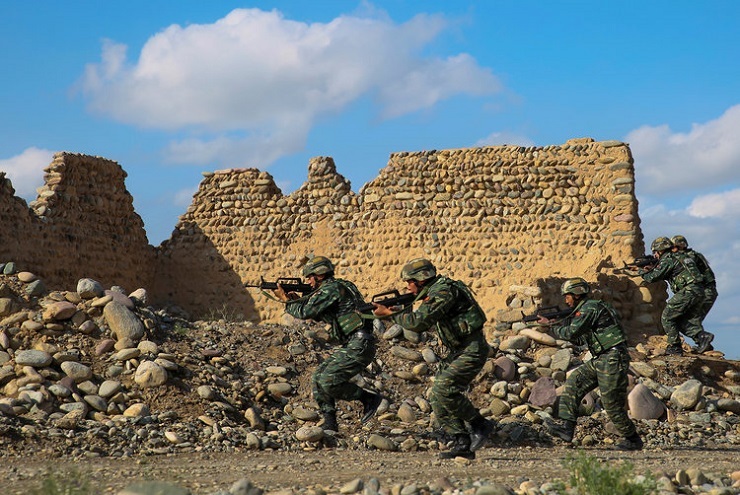 What has been revealed is that Beijing should have sent there at least one fully equipped battalion to Afghanistan to make the training of Afghan troops possible. The reported base was located in the mountainous Wakhan corridor, which is situated at an intersection of three states: Tajikistan in the north, Pakistan in the south and China’s Xinjiang Uygur region in the east. It’s no secrets that separatist forces are operating in the predominantly Muslim region of Xinjiang, with this corridor serving as an entry point to various radical groups. However, one can’t help but notice a serious miscalculation in China’s designs, as it remains ignorant of a uniquely Afghan way of approaching things. Of course, there is some some kind of a contact maintained between Beijing and Kabul, and there are reported cases of direct talks between China’s emissaries and representatives of the Taliban movement. In spite of the fact that a recent Gallup poll conducted in Afghanistan reveals that China follows India in the overall approval among the local population, China’s authorities would hardly understand all the specifics of day-to-day life in the Islamic Republic of Afghanistan, which will result in their inability to establish build contact with the ordinary people of the country.